Bernie Sanders' choice to run as a Democrat means he can't present a real alternative to Hillary Clinton. The upcoming presidential contest was shaping up to be one of the most underwhelming in electoral history. An heir to the Bush dynasty, real-estate magnate Jeb, looked like the safest bet to become the Republican presidential nominee, and challenge the anointed frontrunner from the Democrats’ leading dynasty, business-friendly Hillary Clinton. Few people on the Left, or even among liberals, could manage any excitement about getting “Ready for Hillary,” the former Walmart board member, regardless of the populist veneer she’s been trying out of late. So it’s no surprise that, for many, the decision of Vermont Sen. Bernie Sanders to challenge Clinton for the Democratic nomination offers an alternative. 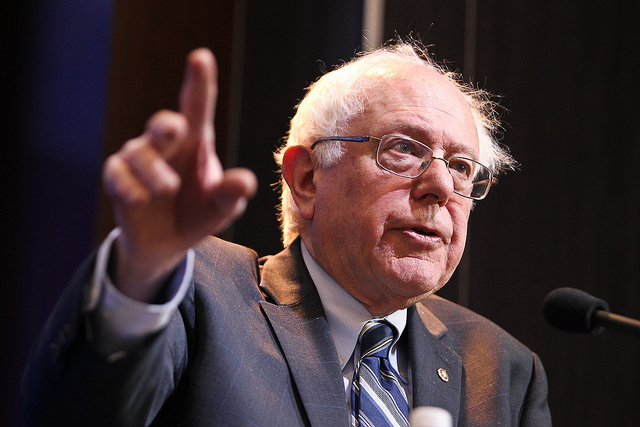 Sanders has positioned himself as a hero of America’s downtrodden workers. He doesn’t run from the label “socialist,” but instead embraces it in his condemnations of corporate greed. He even has a portrait of the great Socialist Party leader Eugene V. Debs hanging in his office. Certainly Sanders will bring all sorts of issues to the Democratic primaries that Clinton would prefer to tiptoe around or avoid altogether. He has promised to call attention to inequality in the United States, the corporate dominance of American politics, and the imminent climate change crisis. But if Sanders really wanted to participate in mobilizing millions to resist the status quo in US politics, he had options other than launching himself into the circus of a Democratic presidential campaign as the designated marginal renegade. And he rejected them. For one, he could have set a very different example, with a far greater chance of success, if he ran for governor in Vermont against the Democratic Party’s incumbent, Peter Shumlin, who has betrayed promises to implement a single-payer health care system; create green, union jobs; and much more. Faced with a budget crisis, Shumlin and the state’s Democrats refused to raise taxes on the rich to fulfill their promises. Instead, they imposed cuts in social services, education, and environmental programs, and laid off scores of state workers. Shumlin even went so far as to call for the banning of teachers’s right to strike. Sanders is Vermont’s most popular politician. With the backing of the Progressive Party, he could have run for governor as an independent and easily defeated both the Democratic and Republican nominees, and never faced the accusation of being a spoiler that is inevitably thrown at any third-party challenger. A victory for a truly independent campaign by Sanders would have been even bigger than Kshama Sawant’s election to the Seattle City Council as an open socialist. In so doing, Sanders could have built momentum for a national third-party alternative to represent workers. In other words, Sanders refused to consider an independent presidential campaign not because he had little chance of winning, but because he didn’t want to compete for votes with the Democrats’ eventual nominee. There’s no reason to believe he will be a “bold alternative” at the end of his doomed campaign for the Democratic presidential nomination. In jumping into the Democratic Party primaries, Sanders appointed a quintessential corporate party insider, Ted Devine, to be his campaign manager. Devine has worked for a series of Democratic presidential candidates, from Walter Mondale to John Kerry. The Democratic establishment can breathe a collective sigh of relief. It doesn’t, in fact, fear liberal Democrats like Kucinich or Sanders, but third-party challenges like Nader’s that have the prospect of breaking their stranglehold on working-class votes, as several local and statewide campaigns have shown over the last few years. Hillary Clinton certainly doesn’t regard Sanders as a threat. She knows that the national election business follows the golden rule: whoever has more gold, wins. Clinton is expected to amass a war chest of more than $1 billion, mostly from Wall Street and corporate America, to pay for advertising, an army of paid staff, and Astroturf support. This will overwhelm Sanders’s fundraising goal of $50 million and his underdeveloped volunteer infrastructure. In fact, Clinton regards Sanders as an asset to her campaign. He will bring enthusiasm and attention to Democratic primaries that promised to be lackluster at best. He will also help her frame the election on populist terms that have widespread support. That benefits the Democrats and undermines the Republicans, who have little to say about inequality, except that they like it. Bernie Sanders isn’t going to pull her to the left because she was already moving that way. She’s talking about issues like inequality and criminal justice reform in terms that she might not have used 10 or 20 years ago. . . . Talking about them in more liberal terms isn’t just good for her in the primaries, it’s good for her in the general elections. You can expect that Clinton will agree with Sanders during the campaign, rearticulating some of his themes in a “more realistic” fashion and occasionally chiding him for taking things too far. Sanders can be counted on to concentrate most of his fire on the Republicans, the Koch brothers, and their reactionary positions, as he has been doing for years. At this stage, Clinton is the overwhelming favorite to emerge as the Democratic nominee. If she stumbles in some irreversible way, the corporate establishment that controls the Democratic Party will come up with another more mainstream candidate, like Barack Obama in 2008. Either way, the eventual Democratic presidential nominee will toe the capitalist line. However much he disagrees with that candidate, Sanders will agitate for trade unionists and social movement activists to vote for the lesser of two evils. The result is that he will help corral people on the Left from taking any steps toward building a genuine alternative to the two-party status quo. Thus, Sanders will follow the well-trodden path of other liberals like Kucinich. In the 2004 Democratic primaries, Kucinich excoriated Kerry and other candidates for voting for George W. Bush’s wars, implementing neoliberal trade agreements like NAFTA, and supporting the racist death penalty. Kucinich thus became the bait on the hook for the Democrats to catch their liberal base. After he lost the primaries, he called on his supporters to support the very candidate he had roundly criticized. Sanders’s campaign will serve the same function. He is already serving that function by luring people on the Left, like the Occupy activists who launched People for Bernie, into a Democratic Party campaign when they might have concentrated their energies on politics outside the party. This is especially ironic when you remember that the Occupy Wall Street encampments were attacked and cleared on orders from Democratic Party mayors — many of them known for being liberals — from Boston to Chicago to Portland to Oakland. Sanders’s retreat is based on a liberal strategy of attempting to transform the Democratic Party from within that has failed for generations. Instead of shifting the Democrats to the left, the leftists who join the Democrats get dragged to the right. Sanders himself is, in many ways, a prime example of this process. Back in the 1980s, as mayor of Burlington — the largest city in Vermont — Sanders did genuinely challenge the two-party system. He went so far as to build solidarity with the left-wing Sandinista Revolution in Nicaragua at a time when Republicans and Democrats were supporting the Reagan administration’s dirty wars in Central America. In the 1990s, however, Sanders set his sights on higher office — not by building an alternative party, but by running as an independent who maintained a collaborative relationship with the Democrats. Nationally, Sanders supported Obama in both of the last two elections, despite the president’s betrayal of his progressive promises and his record of continuity with many Bush policies, from the wars in Afghanistan and Iraq to the bailout of Wall Street. And the Democrats have rewarded Sanders. They instructed their Vermont candidates not to oppose him and sent corporate Democrats like Sens. Charles Schumer and Barbara Boxer to campaign for him. Even worse, Sanders accepted a $10,000 donation from Hillary Clinton’s Hillpac back in 2006, during his first run for Senate. Sanders has similarly moderate positions on many social issues. While he boasts a good voting record on the rights of oppressed groups, it doesn’t stand out among most other liberal Democrats. In fact, on the decisive issue today of racist police brutality, Hillary Clinton is actually positioning herself to Sanders’s left. She has raised questions about the drug war and ending mass incarceration (though, of course, largely to cover her complicity with Bill Clinton’s vast expansion of both). By contrast, in a recent CNN interview, Sanders, after expressing sympathy for cops’ “difficult job,” managed to call only for jobs and community policing. His foreign policy positions are to the right of many liberal Democrats. Sanders voted in favor of George W. Bush’s original Authorization for Use of Military Force resolution that gave the administration a green light to launch the war on Afghanistan. While he did vote against Bush’s invasion of Iraq, he repeatedly supported funding resolutions for both US occupations. And while critical of some aspects of Israeli policy, Sanders has a less than stellar record on Palestine, even going as far as defending Israel’s right to “self-defense” during its bloody assault on the Gaza Strip last summer. Sanders’s backing of US imperialism compromises his support for workers rights. For example, Sanders supports the basing of the new F-35 warplane at Burlington’s airport, despite the fact that the fighter-bomber’s ear-shattering noise made scores of working-class housing unsafe for habitation. Like many leftists before him, the Democratic Party has co-opted and changed Sanders, using him to help hinder the development of a genuine alternative to the capitalist parties. His campaign for the Democratic presidential nomination will be, at best, a re-run of Jesse Jackson’s primary runs in 1984 and 1988. Jackson’s campaigns galvanized an entire section of the Left, channeled it toward the Democratic Party, and directed its remnants to vote for a succession of corporate candidates like Walter Mondale and Michael Dukakis. The recent uprising in Baltimore proves this. Without that revolt, the Baltimore state’s attorney would never have charged the six cops who killed Freddie Gray. Without more struggle, they will certainly not be convicted. At the same time, the Left shouldn’t abandon the electoral arena to the two capitalist parties. If we do so, we will create a vacuum that the Democrats will fill, co-opting movement activists, demobilizing unions and social movements, and redirecting their precious time, money, and energy into electing candidates who then betray workers and the oppressed. We need to win the new left born out of Occupy, public-sector union struggles, and the Black Lives Matter movement to break with the Democratic Party and build an electoral alternative as a complement to struggle from below. Sanders’s campaign inside the Democratic Party is an obstacle to that project. Ashley Smith writes for Socialist Worker and the International Socialist Review .